Sunbridge Institute’s Waldorf teacher education programs work out of an understanding of education and human development as a process of self-education in community. Our teacher education classes are designed to provide opportunities for self-education in a supportive social, collegial context. Waldorf teacher education at Sunbridge Institute includes a deep exploration of child and human development; development of a teacher’s contemplative capacities; exploration of pedagogical approaches and skills; studies in the arts; courses that develop abilities for working in a group of colleagues; and practical learning or mentored teaching in the classroom with experienced teachers. Our programs are designed to draw upon and build creative capacities, developing the thinker, the artist, the scientist, the poet, the environmentalist, and the musician that lives within each of us, just as Waldorf educators draw upon and nuture these capacities within each child. At Sunbridge Institute, you can prepare to become a Waldorf birth-to-age-seven educator through our Early Childhood Teacher Education Program, a Waldorf grades-1-8 class teacher through our Elementary Teacher Education Program, or a Waldorf subject teacher through our specialized certificate programs in World Language Teacher Education or Music Teacher Education. (These specialized subject teacher programs may also be combined with our Elementary Teacher Education program.) For experienced Waldorf early childhood educators wishing to apply their background toward earning their full WECAN credentials, we offer an Early Childhood Completion Track. Sunbridge’s programs are low-residency, requiring infrequent, yet sustained on-campus study. This format accommodates working adults and allows for an important give-and-take between your time in a Sunbridge classroom and your time in a Waldorf teaching setting, each enhancing the other. It also makes it possible for students from all over the country and the world to enroll here, broadening and enlivening our student experience. Our Waldorf Early Childhood and Elementary programs entail a total of 13 and 15 weeks of on-campus study over the course of 25 and 33 months, respectively. Our specialized studies programs (World Language and Music Teaching) require one three-week-long, on-campus summer study and one week-long teacher observation in the following school year. Please see our individual program pages for specific program formats and schedules. Our Elementary Teacher Education program enrolls every July. Early Childhood Teacher Education and its Completion Track alternate every-other-June enrollment. Our two specialized subject programs alternate every-other-July enrollment. Applications are posted October 1 of the fall prior to enrollment. Please visit our separate program pages for specific enrollment dates as well as information on our admission requirements and application process, including special instructions for international students. Students coming to Sunbridge represent a wide range of ages, backgrounds, and interests. Many are already working in Waldorf classrooms (a requirement for our practioner-based Early Childhood program), while some are brand-new to teaching (or to Waldorf teaching). Some are young people embarking on their first career; others are more seasoned adults, many looking to make a mid-career change. Some are Waldorf school graduates themselves and some are Waldorf parents inspired by their children’s experience. Many students come to us from a background in other educational philosophies. There are nearly 1,000 Waldorf schools and 2,000 Waldorf early childhood programs located throughout the world, including about 170 Waldorf schools and 250 Waldorf early childhood in the US, plus additional initiatives, early childhood programs, and charter schools that incorporate aspects of Waldorf Education. However, with only 16 Waldorf teacher education centers in all of the US, Canada and Mexico, there are not nearly enough newly-credentialed Waldorf teachers graduating each year to meet the nationwide and worldwide need for qualified English-speaking Waldorf teachers. A majority of Sunbridge program students are offered Waldorf teaching positions prior to their Sunbridge graduation; by graduation time, virtually everyone wishing to teach in a Waldorf school has been offered a job. Sunbridge’s teacher education programs are fully recognized by AWSNA, and our Early Childhood Teacher Education Program is also fully recognized by the Waldorf Early Childhood Association of North America (WECAN). These credentials give your Sunbridge diploma worldwide status. However, because specific licensing requirements and/or government regulations for teachers vary from state-to-state in the US and from country to country, it is important to research these appropriate regulations and requirements. If you would like to further investigate Waldorf Education and Waldorf teaching, Sunbridge’s “Waldorf Weekend” workshops, held each January and July, and our Open Days, held each October and February, are great opportunities for you, as is our “Introduction to Waldorf Early Childhood Education” Summer Series course. See our Events Calendar for upcoming dates of these and other relevant workshops, courses, and events. Visiting a Waldorf school in your area is also a good way to learn more about Waldorf teaching. 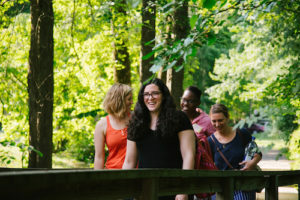 Most Waldorf schools offer opportunities for visitors to attend admissions events that include tours, lectures, presentations, and class observations. Listings of Waldorf schools in the US and across North America may be found at waldorfeducation.org, while listings of Early Childhood programs may be found at www.waldorfearlychildhood.org. A Sunbridge article in the Fall 2016 issue of Lilipoh magazine is a place to read about Waldorf teaching and teacher education (focusing on grades teaching). If you have any questions, we encourage you to contact us or call Barbara Vitale, our admissions and summer coordinator, at 845-425-0055 x20.